The first step to compensating for eye loss is to determine what exactly has changed and how that change affects perception. 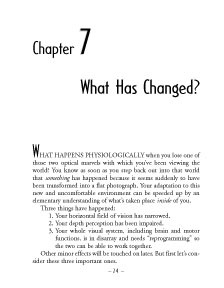 Here, Mr. Brady provides an accurate and understandable description of the visual system from the unique perspective of a scientist and a person who has experienced changes to this system firsthand.  Your depth perception has been impaired. Many of these losses can be compensated for with increased attention; and they soon become merely "a nuisance."